Cary Edmondson/ReutersAnquan Boldin has 825 receiving yards this season. In his two seasons in San Francisco, Anquan Boldin has been the 49ers’ best wide receiver. When the 49ers traded for Boldin in 2013, it was widely regarded as a solid move to secure depth at wide receiver. Boldin had just won a Super Bowl with the Baltimore Ravens, and was unwilling to take a pay cut from his $US6 million salary, so the Ravens traded him. The Ravens had considered releasing him, but ended up getting a 6th-round pick from the 49ers instead. It was a low-risk move for San Francisco. In the worst-case scenario, Boldin’s production would decline at age 32 and they’d lose a 6th-round pick. In the best-case scenario, they’d pick up a No. 1 wide receiver for almost nothing. Boldin hasn’t just been a consistent receiver — he’s been their best receiver the past two seasons. In 2013, Boldin led the 49ers with 1,179 receiving yards to go with seven touchdowns. This season, Boldin has 825 receiving yards — nearly 300 more than the team’s No. 2 receiver Michael Crabtree — and four touchdowns. Boldin was supposed to be a receiver to complement Crabtree (who missed the first 11 games for the 49ers) in 2013, but he’s since emerged as their top receiver and one of their best endzone targets. 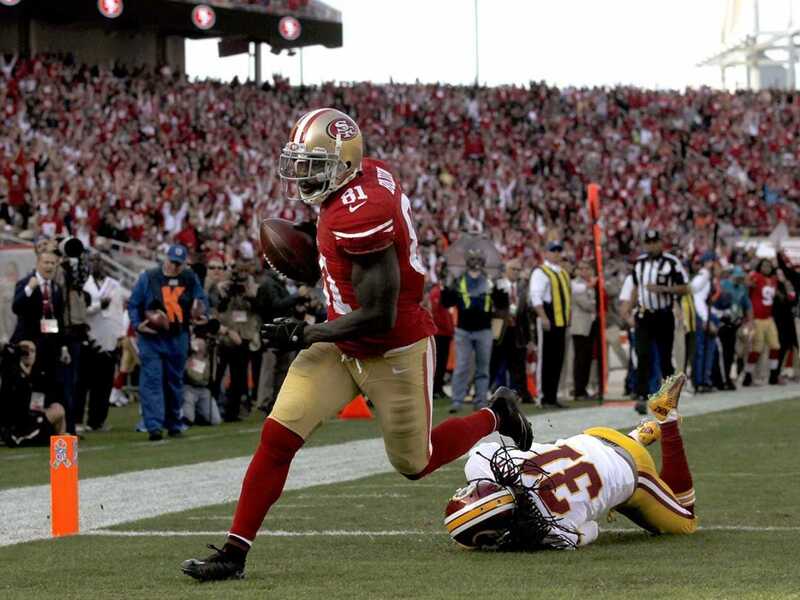 On Sunday, Boldin had arguably the biggest play of the game in the 49ers’ 17-13 win over the Washington Redskins. In the 4th quarter with the 49ers down 13-10, Boldin made a huge 23-yard catch, obliterating Washington safety Ryan Clark, gaining an additional six yards after the hit and 15 more yards when Washington got called for unnecessary roughness. After that he made another 10-yard catch, setting the 49ers up for a running touchdown by Carlos Hyde to take the lead for good. He finished with 137 yards for the game, his first 100-yard game of the season. The Ravens used the 2013 6th-round pick from the Niners to move into the second-round in a trade with the Seahawks. The Ravens drafted Kansas State linebacker Arthur Brown, who has 11 tackles in his second year with Baltimore.